When I was little, my aunts and uncles would get together at my grandparents house all the time. They’d sit around the kitchen table and drink coffee while chatting. I remember always wanting to drink coffee like the grown-ups so my grandma would give me “coffee” in my own cup. Unbeknownst to me at the time, it was hot chocolate. Since then hot chocolate has always been my favorite warm drink. And I can’t stand coffee because it doesn’t taste like hot chocolate. This year I wanted to make something special for the kids for Christmas Eve. 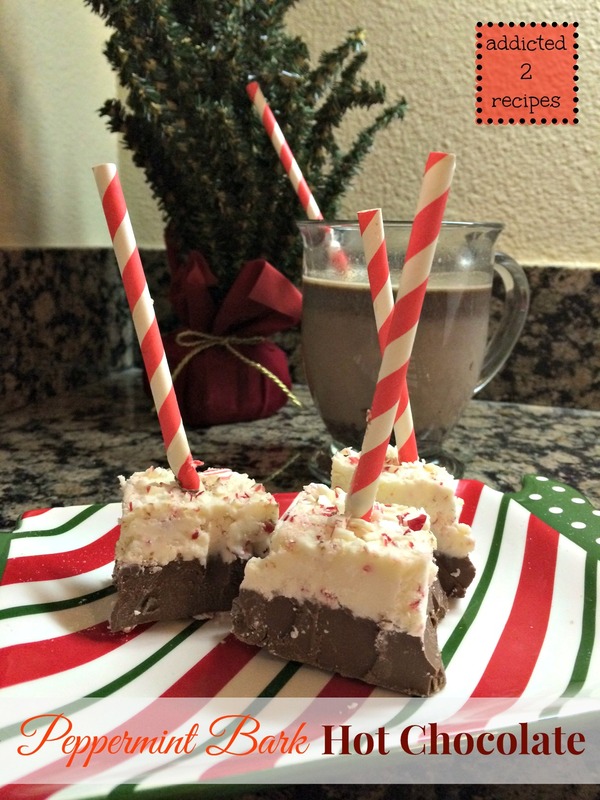 I think I found it in this peppermint bark that you can turn into hot chocolate. When I was making my hot chocolate for this post, I was face timing with my niece and nephews and my niece was so excited when she saw the bark. I can’t wait to make it with her and the boys. Prepare an 8×8 baking dish by placing parchment paper in the dish. Melt the chocolate bark (separately). My favorite method is from thekitchn.com. Place about an inch of water in a large sauté pan. Bring to a simmer and turn off heat. Place chopped chocolate bark in a heatproof bowl and place in the water. Let chocolate melt. Pour melted chocolate in baking dish and let set. Repeat with white chocolate. Once melted, add peppermint crush and mix to combine. Add to set chocolate bark. Once chocolate sets and starts to firm, place straws in chocolate. When chocolate is firm, cut into squares. Note: I put my chocolate in the refrigerator to set and it got too hard so I had to sit it out to let it loosen again. Oops. Add bark squares to a mug and pour warm milk over to make hot chocolate.